Before you start playing this game, just imagine the scene: you walk into an ice cream shop and ask for a single scoop in a cornet, but the vendor is not just giving you one, but keeps adding the scoops continually and you watch your treat become higher and higher. Everyone’s favourite treat and a childhood dream served as a good inspiration for this ice cream themed pokie machine, where you can win more if manage to match the flavours of the ice cream scoops. Thunderkick is a relatively young company and a new player in the arena of pokie machines. Based in Stockholm, Sweden, the company was founded in 2012 by a team of experienced gaming and game development engineers that previously worked for another powerhouse – Net Entertainment. 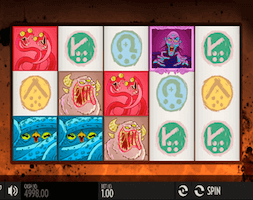 Pokies form the Thunderkick’s portfolio are really innovative and unique and range from nice and colourful, such Sunny Scoops, to a bit darker like their major hit Børk the Berzerker. 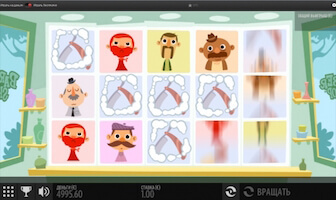 Sunny Scoops is the ice cream-themed pokie machine with 3 reels, 3 rows and 14 paying lines. Instead of classic symbols, you’ll see three empty cornets and your goal is to fill it with the scoops of the same colour. The game also features a bonus round and free spins with multiplied winnings. 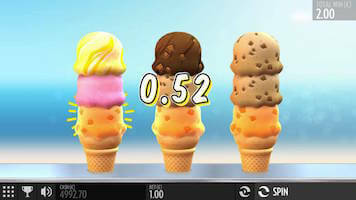 Different flavoured scoops of ice cream that can help you form a winning combination have their own names, which is another interesting addition and a unique feature in the world of online pokies. In order to collect some coins, you need to match 3 of the following: Chocolate Explosion, Golden Honey, Orange Sunset, Sweet Pearfaction, Blueberry Bite, Strawberry Dream and Coffee Crush scoops. The Bonus Wheel is the game’s main feature and you will activate it once you manage to collect at no less than 3 of the same ice creams in the same vertical paying line. The Wheel will automatically start to spin and reveal multipliers ranging from 2 to 7 times your stake. You can actually score some money during this feature, but the real fun starts when you hit the Flavour symbol, designed to activate the Bonus feature. When you activate it, the game will take you to a brand new themed screen and award you with 10 free spins. During the bonus round, all your winnings will be multiplied and you will receive an extra bonus spin, which can lead to some very decent payouts. The Sunny Scoops pokie machine offers a bit smaller jackpot prize than expected – you can score the game’s main prize worth 500 coins only, but bearing in mind the betting values that range from $0.10 to $10, you can actually get enough coins to buy the entire ice cream shop. 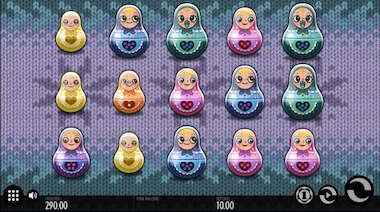 Although a very colourful game with a good visual quality, Sunny Scoops can’t really match the standard of some of the more cinematic pokies, but that really wasn’t the designers’ idea. This nice and interesting pokie machine comes with a jaunty little tune and suitable sound effects, designed to improve your overall fun experience. The game doesn’t offer any large jackpot prizes, but its return to player percentage of almost 97% makes it a great choice for less experienced players. 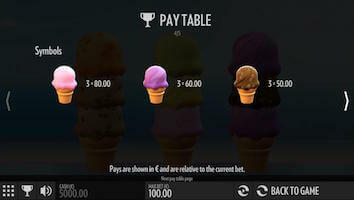 Of course, there are no obstacles for experienced gamers to try to match different ice cream flavours and return home with up to 500 coins in the bankroll.